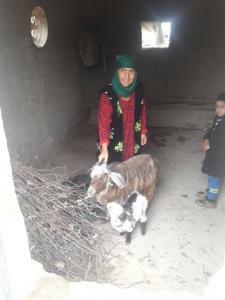 to purchase livestock, develop her business, renovate her house and create comfort for her family. Ulug benötigte 325 US-Dollar, um ein Gewerbe im Bereich Landwirtschaft auf- oder auszubauen. Das Geld wurde gesammelt und für Ulug bereitgestellt. Ulug is very grateful for the support and caring. She bought livestock and has expanded her activities. With the profit amount she made renovations to her home. Ulug again wants to seek support and make a profit. She wants to buy another pair of young bulls with a loan.